I’ve been photographing weddings at Southern Oaks Plantation in New Orleans on a regular basis since 2007. 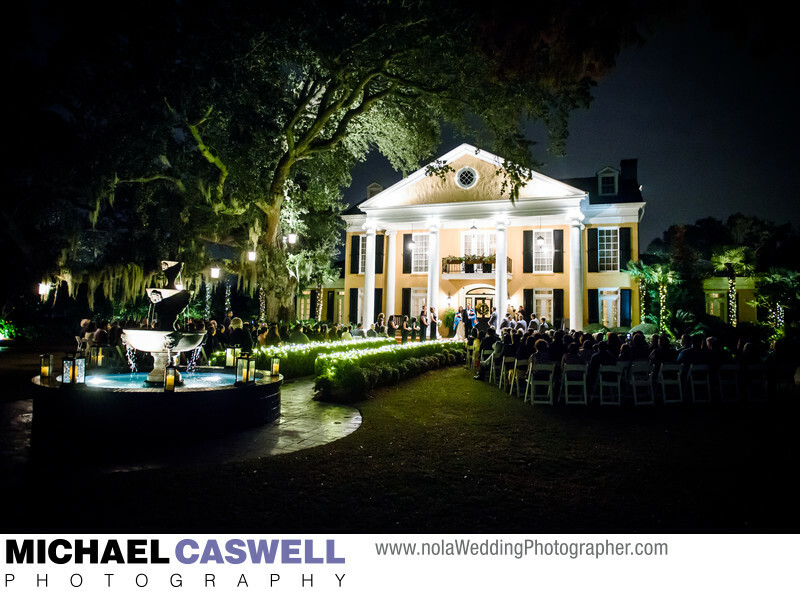 Over the years, I’ve captured tens of thousands of photos of nuptial celebrations at this location, but this image of a nighttime ceremony in front of the graceful plantation house is one of my favorites. In this photograph, the elegant home is brightly illuminated and the uplighting on the massive oak tree dramatically highlights its natural beauty. The bride and groom were of Native American descent, so they incorporated some traditional cultural elements such as the blanket ceremony captured in this image. My first wedding here was back in January of 2007. Now, more than a decade later and with more than 40 events at this location under my belt, I'm exceedingly experienced at the venue and how events are run there, and I am intimately familiar with how to capture beautiful photographs of weddings at this top-notch facility. Because I've worked at this location so many times, in every season, and for early afternoon, late afternoon, and night time ceremonies, I have experience here in just about any weather or lighting conditions. Southern Oaks is universally praised by couples and guests. This venue does so many events, they have it down to an exact science. Members of the Asaro family, which owns and have run the venue for decades, are almost always present to greet the couple and the families personally, and his expert staff of hosts and hostesses are dedicated to ensuring couples and their guests have a stress-free and unforgettable experience. Plus it's beautiful, both in the daytime and at night, with very little (or no) decorating of the outside or inside needed, and new decorative features and improvements are added on a regular basis. It's no wonder that this is such a wildly popular place to get married, both for locals and for destination couples! Ask any New Orleans wedding photographer or videographer what their favorite venue to work at is, and there’s a very good chance they will say Southern Oaks Plantation, because events go so smoothly there. This allows us to concentrate on doing our job of capturing beautiful imagery of the event and not be sidetracked with keeping the reception on track. Additionally, they always make sure photographers and videographers get a good meal during the time when the newly married couple and their guests are eating which, naturally, is the perfect time for us to eat as well, since there's usually not much going on during this period. Another benefit of this venue is how they handle inclement weather. Through the dozens of Southern Oaks weddings I've photographed over the years, though there were several close calls, only one single time did a ceremony have to be moved inside due to rain. The reason for this track record was made obvious on that one occasion... while many venues will want the decision to move inside made an hour or two before the ceremony start time to give them time to set up the space, Southern Oaks is able to wait until the last possible moment if the radar or forecast hints that the rain may clear in time. They can do this because their large and efficient staff can be called upon to quickly swoop in and set up the ballroom for an indoor ceremony in the blink of an eye (I'm convinced they run military-like practice drills, with a stopwatch!). Likewise, If a brief rain shower does happen to move through before the ceremony begins, the staff can very quickly dry off the chairs for your guests. As a result, your outdoor wedding ceremony is given the greatest chance of proceeding as planned, as there are few things as frustrating as seeing a ceremony get moved indoors only to have the weather clear up in time for it to have remained outside as originally planned if the decision could have been deferred until just a little later. That said, it should be noted that even if the ceremony must be moved inside, the spacious and beautiful ballroom is well suited for this, with large windows along the back wall overlooking the lushly landscaped pool and garden area, and horse stables where equine brothers Magic and Majestic live. Another option for your ceremony (if the expected number of guests attending allows) is under the massive oak tree that graces the front of the home. While the traditional location of the front steps of home is beautiful, this alternate spot has a bit more of an intimate, park-like feel to it that some couples may prefer.